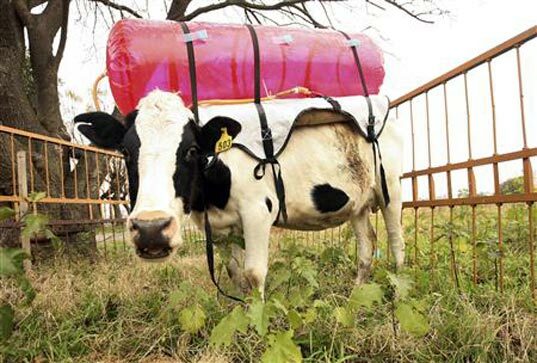 Burp Catching Backpack To Trap Cow Gas! under Air quality, Environment, global warming, Poo Power! Ah, green design at its finest. 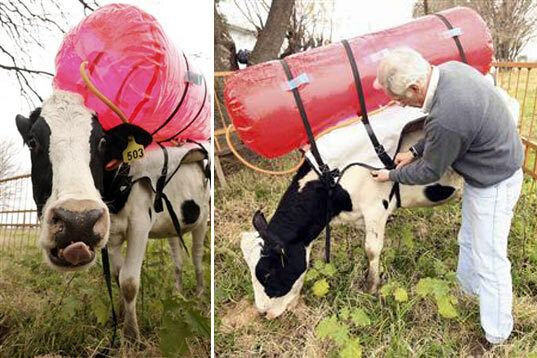 Here at Inhabitat we pride ourselves in bringing you the freshest eco-friendly innovations, so how could we pass on the merits of this bright pink burp-trapping bovine backpack? It’s more than just a catchy concept – believe it or not there’s real SCIENCE at work here! The methane collecting tanks were utilized by Argentina’s National Institute for Agricultural Technology as part of a a study to determine the atmospheric impact of methane released by cows. The findings were startling, as researcher Guillermo Berro estimated that “30% of Argentina’s total greenhouse gases could be generated by cattle.” Time to seriously consider that poo power plant! As off-key as it may sound, methane is a potent greenhouse gas and livestock emissions can contribute a significant share to atmospheric pollution. A single cow is capable of producing from 800-1000 liters (25-35 cubic feet) of emissions every day, which adds up quickly when you consider the 55 million cattle that comprise Argentina’s massive livestock industry. Berro’s study harnessed ten cows with methane-collecting tanks that captured emissions released from their stomachs, allowing researchers to analyze and extrapolate the environmental impact of raising cattle. The study has sparked interest in the issue and follow-up studies are investigating new diets that reduce methane emissions by making it easier for cows to digest food. This is such BS. What is the concentration of CH4 in those balloon? Aha haa haaa... I am laughing at the backpacks (imagine the uproar from NZ dairy farmers having to buy and use these!) and from clairsearch's awesomely ignorant comment: "Plants and animals are part of a closed system and can’t *add* CO2. People really don’t seem to understand this for some reason." Uhhh... so you think if we chop down all the worlds trees, turning the forests into farmlands for cows, this will have zero effect on the environment? Let me educate you a little... the world found a natural equilibrium between plants and animals a few thousand years ago and it was changing slowly. More recently, resource hungry humans have changed this equilibrium through our ability to massively change the environment faster than mother nature can adapt (well, arguable as the current adaptation strategy by mother nature - climate change - may result in the death of billions, possibly rebalancing). The plant/animal emissions equilibrium that you refer to is being changed faster than our planet can adapt. Hence the planet is suffering a slight sickness we call climate change. Color me vegan...feed me a bowl of greens and plug a hose in my side which leads to the methane combustion engine in my eco friendly vehicle...i need to get to town! Having recently witnessed a cattle \"city\" in Nebraska on a cross-country drive I agree the problem lies not with the cow, but the humans who penned them. A cattle city looks like a bovine Darfur, sans the tents. On the same drive I saw free-range cattle in Wyoming who fed off grasses and were allowed to roam as nature intended. While I cannot advocate strict vegetarianism being one reluctant to give up the luxury of the occasional Neiman-ranch burger, I can definitely side and agree with those who wish to massively reduce our production and consumption of meat. The question is, what will be done to educate the majority that eating meat in the quantities they are used to is unhealthy, and more importantly what will be provided as a healthy, (and tasty) cost-conscious alternative? In the late 1970s a Wisconsin senator pushed the FDA to educate the US populace about over-consumption of Beef, only to have his career destroyed by Big Beef lobbyists. The only concession the FDA made? The creation of the \"food pyramid\" and pushing the meme of \"nutrients\" which to this day are used to mis-educate people regarding the importance of different foods. I agree with cpine and jeanX. The problem is not the cows, it's the people. It is not fair to punish the cows for our practices. If I were a cow, I would be very upset if someone put a hose in my stomach and made me carry my excess gas on my back, even if the container is a pretty bright pink. I would moo, and they probably wouldn't understand what I was saying, and I'd be forced to carry around this flipping backpack for who knows how long. But is this a problem at I, as a cow, have created? No. Cows have always produced methane. And they always will. Humans, however, produce the bulk of our noxious gases by choice. As such, we should not force other species to pay for our choices. We should instead evaluate our lifestyles. Poor cow indeed. It is the worst idea concerning the ecologie. Make suffer an animal for CO2? it is dismaying.Do it for you! This cow has an ostomy? This is unethical. Do you see that streak of filthy, matted hair where the hose is inserted through the cow's side into it's stomach? Clairseach is correct that plants don't make "extra" CO2, but it takes 16lbs (7 kilos) of plants to raise 1 lb (.5 kilo) of beef, so all that grain is raised to very inefficiently create hamburgers. If that grain was used to feed people, we'd need to grow less and raise fewer cows (less methane) and we wouldn't be raising cows to live short, miserable lives; now with a crazy backpack and a hose stuck through a hole in their side. greymasse is justifiably defensive about an ethic based on nothing more than what his or her mouth wants. People, let me enlighten you a little bit. In Argentina less than 5% of the cows are fed in feed lots. Cows are fed mainly by grass in the open field. Usualy cows are brouth to the field where there used to be something planted, so they can fertalice the ground again. And Clairsearch, nobody talked about CO2, we are talking about Methane. I think this is a good initiative. The only way you can add CO2 to the atmosphere is by burning fossil fuels. Plants and animals are part of a closed system and can't *add* CO2. People really don't seem to understand this for some reason. It's ironic that this comes from Argentina where as a rule, cattle is grass fed and mostly organic with feedlots being a recent addition. mia, i think you may be reverse engineering the problem as well. adopting a plant based diet is the real engineering solution here. even without considering the greenhouse gases it makes ecological sense. from water used in beef production to the number of people we could feed in the world if we didn't cycle our grain through livestock, then eat the livestock. people need to realize that vegetarianism is environmentalism. The best way to combat this problem is to go back to pasture-raised beef. The real problem is that we are concentrating the animals on feed lots where they are fed grain -- particularly corn. Cows were meant to eat GRASS, and that\\\'s why it is so hard for them to digest corn, and hence the gas (not to mention copious other health problems, but that\\\'s another story). This project sounds a lot like reverse-engineering a problem that we created ourselves. Why not just go back to the way nature meant it to be? Ah, green design at its finest. Here at Inhabitat we pride ourselves in bringing you the freshest eco-friendly innovations, so how could we pass on the merits of this bright pink burp-trapping bovine backpack? It's more than just a catchy concept - believe it or not there's real SCIENCE at work here! The methane collecting tanks were utilized by Argentina's National Institute for Agricultural Technology as part of a a study to determine the atmospheric impact of methane released by cows. The findings were startling, as researcher Guillermo Berro estimated that "30% of Argentina's total greenhouse gases could be generated by cattle." Time to seriously consider that poo power plant!